Conflict between local pastoralists and lions remains a tricky problem in lion conservation, but reinforcing traditional fencing structures called “bomas” may provide a cost-effective solution. A study found adding chain-link fences to bomas cut livestock losses to top predators by 75 percent, according to the research. When looking at cost, partially reinforced bomas – as opposed to fully reinforced – was actually a more cost-effective solution to the persistent problem of livestock loss in Kenya. Living together can be hard. But put people and their livestock close to lions and other hungry predators, and it’s as hard as it gets. In East Africa, wildlife and local people often clash, as predator attacks commonly threaten the livelihoods of pastoralists. In turn, locals retaliate against predators –most especially lions– straining further the future of these already threatened cats. A recent study published in the journal Conservation Evidence finds that setting up chain-link fences is a cost-effective solution for reducing the number of animals lost to big predators every year – and thereby protecting both livestock and big predators. Researchers looked at how much strengthening these structures, known locally as “bomas,” reduced depredation in Kenya’s Western Mara region by analyzing the success of the Boma Fortification Program, which is run by U.S.-based charity Anne K. Taylor Fund. They found that building chain-link fences around bomas to protect livestock can cut depredation of cattle by almost 75 percent. “Whether one cow or one thousand cows, everyone wants to protect their animals,” Dr. Alexandra Sutton, said lead author of the study and doctoral candidate at Duke University’s Nicholas School of the Environment. While husbandry practices throughout the day are largely effective at keeping predators away, domestic animals remain vulnerable at night. But traditional bomas – circular, open-air structures made of acacia thorns – are not solid enough to withstand some attacks. Predator attacks lead to average losses of more than nine heads of cattle per household annually, estimated at $1,870. Traditional boma structure in Western Mara, Kenya. Photo by Dr. Alexandra Sutton. Lions are most often blamed, even if unfairly, for livestock losses, according to Sutton. She added that even when locals know a different species killed their animals, their attitudes towards lions do not lighten. “This means that the identity of the actual predator almost has little to no impact on people’s perceptions and the resulting risk to lions,” Sutton said. Listed as Vulnerable by the International Union for Conservation of Nature (IUCN) since 1996, lion populations have dropped by 43 percent between 1993-2014. Today, lions occupy only about 22 percent of their historic range in sub-Saharan Africa. Habitat loss, poaching and trophy hunting continue to take a toll on them, along with an increasing commerce in lion bones used as medicine in Asian markets. 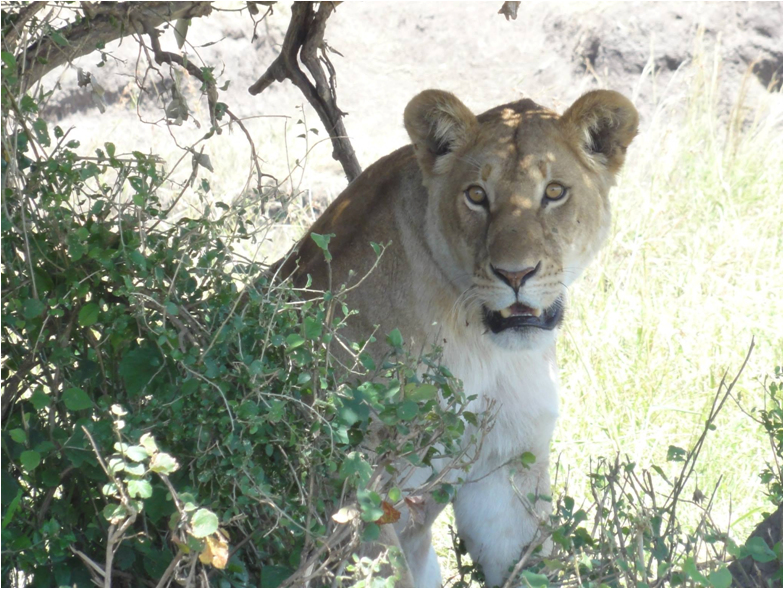 Lioness in the Mara region. Photo by Dr. Alexandra Sutton. 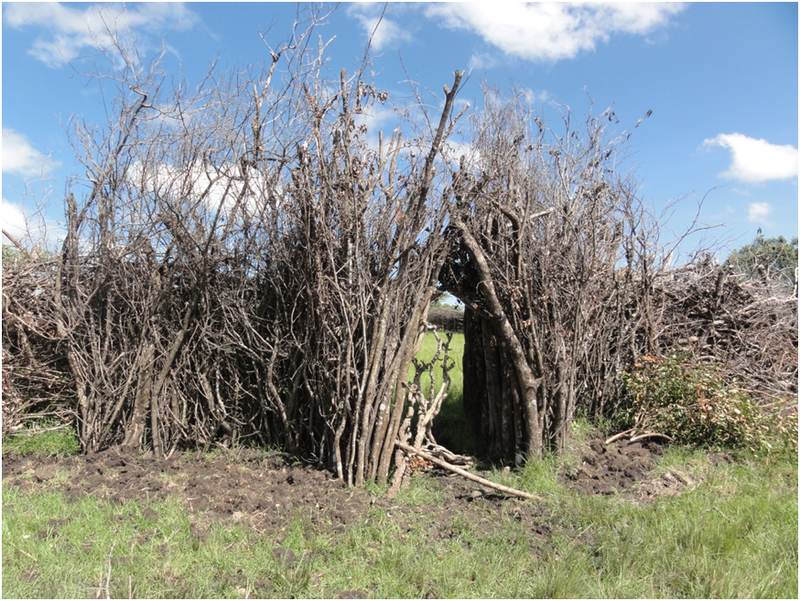 Sutton’s study compared the efficacy of full and partial boma fortification in the region to traditional structures by conducting interviews with more than 300 households over three years. Partial improvements involved wrapping the wood with chain-link fencing, while full fortification also included steel wires and corners, cement and wood posts. Between 2013-2015, reinforced bomas lost an average of 0.35 animals per month, though 67 percent of them lost none. Only seven percent lost more than ten heads of cattle. At the same time, traditional bomas lost 0.96 animals on average every month. Thirty-two percent of them lost more than ten animals. Only 10 percent recorded no losses. If cost is factored in, the researchers found that partially fortified structures are actually more beneficial than fully improved ones, giving a 778 percent return on investment, compared to 349 percent for the latter. 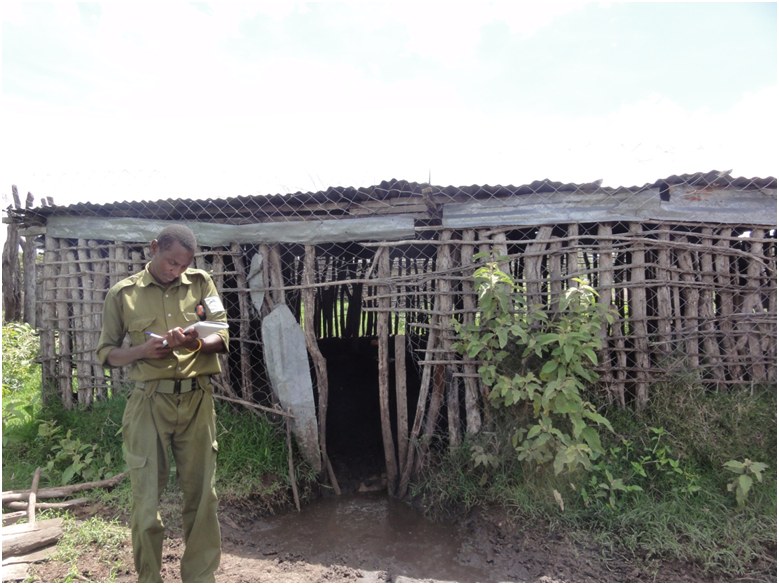 Field team leader Elias Kamande in front of a boma reinforced with wire and a roof. Photo by Dr. Alexandra Sutton. Though the study suggests that herd size and financial considerations influenced whether locals decided to improve the bomas, locals received the project well overall. She added that requests are rising for fences in the region, but carrying materials from Nairobi over rugged terrain makes ramping up efforts both challenging and expensive. Still, according to Sutton, working with locals is absolutely necessary if the world is to continue to be home to lions and other top predators. “We must listen, observe, look at specific regional, ethnic, socioeconomic cultural perspectives and worldviews of people living with wildlife,” she said.